Is there a better alternative to Acrosync? Is Acrosync really the best app in File Management category? Will Acrosync work good on macOS 10.13.4? Acrosync is a folder synchronization tool that supports Dropbox-style automatic file upload, as well as hourly incremental backups similar to Time Machine. Acrosync is based on the rsync protocol, which means it can sync with any Mac or Linux computer, or even a NAS device, without server installation. It comes with an easy-to-use graphical interface with which you can easily set up multiple sync profiles for different tasks. Acrosync needs a rating. Be the first to rate this app and get the discussion started! Once configured, you will need just one click to start the sync. Only the new and modified files will be transferred, and, for each modified file, only the changed parts will be transferred, thanks to the clever rsync algorithm. Under the new 'Backup' mode, there is a built-in file system monitor which will constantly watch local folders and automatically start transferring new or modified files once they are detected. Full backups can be performed hourly, daily, or weekly at specific times. 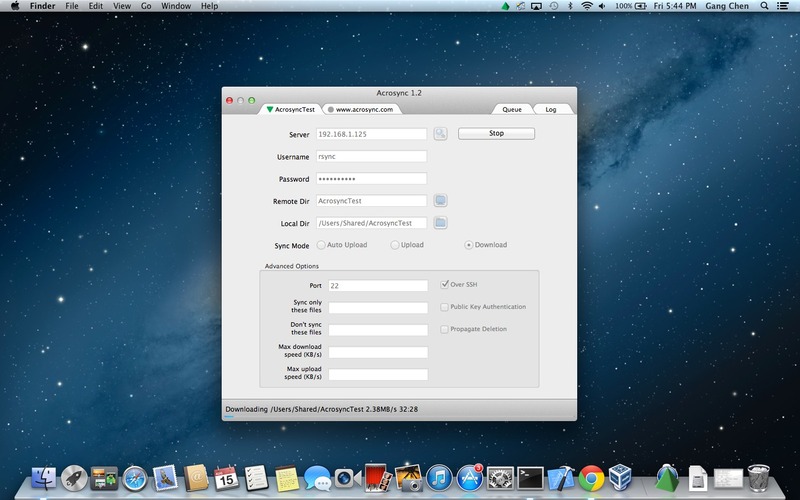 To use a Mac computer as a server, the 'Remote Login' option must be enabled in the 'System Preferences' setting under the 'Sharing' categories. Acrosync is compatible with rsync hosting providers such as HiDrive and Strongspace, as well as QNAP and Synology NASes.